extension to the Singapore trip to get in some good diving. the flight back to Manchester. Seaquest Hotel in Semporna was the break in the journey. down the beach or into the inerior of the island. opportunity for swapping notes on world diving. photgraphs of a shy mandarin fish. and an octopus in the shallows at the end of the dive. etc) but too much man-made rubbish for my liking. quite windy (which keeps the huts cool at least). the trip of a lifetime for you. For other dive operators going to Sipadan see the SCUBA Travel Malaysia Diver Operators page. For the diving around Sipadan see the dive sites page. A new report in Pediatr Emerg Care condiders the medical implications for young SCUBA divers. Worldwide, more than 1000 scuba (self-contained underwater breathing apparatus) diving injuries per year require hyperbaric recompression. Approximately 80 to 90 fatalities per year are reported in North America. On average, there were 16 diving injuries requiring recompression in scuba divers aged 19 years and younger in North America between 1988 and 2002. The youngest injured diver was 11 years old and the youngest fatality was 14 years old. Journal reference: Pediatr Emerg Care, October 1, 2005; 21(10): 681-6.
the crab returns to its old shell and continues it search. effortlessly mobile and shares the crab’s meals. Dardanas species are nocturnal with dark-adapted eyes. Are you thinking about a career in commercial diving? If so read "The Simple Guide to Commercial Diving". 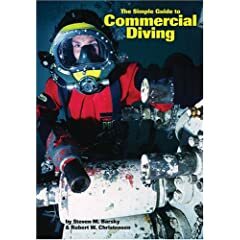 Barsky and Christensen's book covers the skills and attitudes needed by a successful commercial diver in a straight-forward and forthright way. The book starts with a scary warning page before you even get to the contents, summarising the physical and emotional dangers of commercial diving. Once you get past that it describes the training you need to be a commercial diver, the types of work the divers do, the equipment used and the the attitude you need to be successful. The book is amply illustrated with 160 black and white photos and diagrams. If one of the lines in the book is true: "The more you know the longer you live" then any aspiring commercial diver should buy this book for the insight and advice it provides. Steve Barsky started diving in 1965 and was certified as a diving instructor in 1970. He trained as a commercial diver between 1974 and 1976. He has since worked as a diver in the North Sea and the Gulf of Mexico, before moving to first Diving Systems International then Viking Dry Suits. In 1989 he started his consulting company - Marine Marketing and Consulting. He has written 16 books and in 1999 formed the publishing company Hammerhead Press. Bob Christensen was a US Navy diver before becoming a commercial diver. In 1969 he was invited to become an instructor at the Marine Diving Technician Program in Santa Barbara. He ultimately taught in this program for 16 years before retiring in 1985. A few years into retirement Bob started working with Kirby Morgan Diving Systems Inc and is still associated with them. Self-contained underwater breathing apparatus (SCUBA) diving has become an increasingly popular recreational activity, enjoyed by millions of individuals. There has also been a growing interest in SCUBA diving in the disabled population for rehabilitation and recreation. This review, published in the American Journal of Physical Medicine and Rehabilitation, discusses medical issues relevant to individuals with disabilities who wish to participate in SCUBA diving. SCUBA diving can be an enriching experience, potentially helping to improve self-image and quality of life. Knowledgeable healthcare professionals can help to guide their patients who are interested in SCUBA diving. Journal Reference: American Journal of Physical Medicine & Rehabilitation. 84(5):369-375, May 2005. - Dangerous underwater animals and what to do in an emergency. on every dive he carries 2 Subal housings for Nikon F90x, one with a 55 mm micro lens and macro port and the other with a 14 mm rectilinear lens and dedicated wide-angle port. in a Subal flash Housing. Complete Diving Manual, Jack Jackson, International Marine Publishing ISBN: 0071457836. Divers in northern Australia, are calling for development of crocodile warning devices following the second fatal attack in under a week. About a dozen people have been killed by saltwater crocodiles in Australia in the past 20 years. The numbers of crocodiles have increased rapidly in recent years, due to a ban on hunting passed in the 1970s. The deaths have also reopened debate as to whether limited limited hunting should resume. The saltwater crocodile (Crocodylus porosus) is the largest living reptile in terms of mass. There is a large population in Australia, with the majority being in the Northern Territory. A great white shark, nicknamed Nicole, has made the journey between South Africa and Australia and back in under nine months. The new research published in Science is the first proof of links between populations of different continents. "This is one of the most significant discoveries about white shark ecology and suggests we might have to rewrite the life history of this powerful fish," said researcher Dr. Ramon Bonfil, shark expert and lead author of the study. "More importantly, Nicole has shown us that separate populations of great white sharks may be more directly connected than previously thought, and that wide-ranging white sharks that are nationally protected in places such as South Africa and Australia are much more vulnerable to human fishing in the open oceans than we previously thought." The story of Nicole began on November 7, 2003, when Bonfil and his colleagues from the Marine and Coastal Management Department of South Africa and the White Shark Trust attached a satellite tag to Nicole’s dorsal fin as part of a large study on white shark migrations. The tags—specifically known as pop-up archival tags—record data on time, temperature, water depth, and light levels as the shark moves through its habitat. On a pre-recorded date, the tag detaches from the shark and floats to the surface, where it transmits its data sets to a researcher’s computer via satellite. An additional 24 white sharks were tagged with similar tags and seven more with real-time satellite tags during this study, with Bonfil and his team often having to wrestle the dangerous sharks while on a cradle in order to fix the satellite transmitters to their dorsal fins. While most of the tagged white sharks revealed at least three different movement patterns, including wide-ranging coastal migrations up and down the eastern side of South Africa, Nicole headed out into the vast and deep basin of the Indian Ocean. The track estimated from the data transmitted by the tag revealed that Nicole followed a strikingly direct route towards Australia, on a path void of oceanic islands. Although Nicole took frequent plunges to depths as great as 3,215 feet (980 meters—a record for white sharks) while crossing the Indian Ocean, she spent most of her time (61 percent) swimming along the surface, leading researchers to suspect that perhaps great white sharks use celestial cues for transoceanic navigation. Ninety-nine days later, Nicole was swimming about a mile from shore just south of the Exmouth Gulf in western Australia, where her tag detached and floated to the surface with all of her secrets. This leg of the journey alone—some 6,897 miles (11,100 kilometers)—was one for the record books. However, Nicole would resurface again on August 20, 2004, not in Australian waters, but back in Gansbaai, South Africa, where she was tagged just under nine months before. Her distinctively notched dorsal fin was photographed by Michael Scholl, one of Bonfil’s team researchers and compared to previous photographs he had taken over a period of six years. After a detailed comparison of images of dorsal fin notches and markings, there was no longer any doubt: Nicole had returned to her home waters. Shark fishing has, theoretically, been illegal since 1973, when Egypt became one of 100 countries to sign the CITES (Convention of International Trading of Endangered Species) Treaty. Sharks in the Red Sea were on CITES' list of endangered species, but the Egyptian law that regulates fishing made no mention of sharks. "Sharks are a valuable source of revenue for the country. Many people don’t realize that tourists spend millions of dollars in the Red Sea because of the sharks. 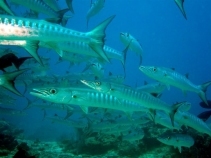 For example, a dive destination like the Brother Islands (off the coast of Marsa Alam) is sold primarily because of its abundant shark population. It has been estimated that each shark in the Red Sea generates approximately 10,000 pounds sterling in income to the country," said HEPCA's Director. The problem began to reach alarming levels in 2000, when divers and conservationists started noticing a marked decrease in shark populations. The decline in numbers was mainly attributed to an increase in the number of fishing boats in the Red Sea. This new wave of commercial fishing, coupled with the rise of a handful of trading companies that were being established solely for the purpose of exporting in-demand seafood delicacies (including sea cucumbers and shark fins) to the Chinese market, were an environmental catastrophe in the making. It is difficult to quantify Egypt’s current shark population and how much it has suffered over the years, but divers claim that sites near Sharm El-Sheikh and Hurghada that have always been known as prime shark viewing destinations are becoming less and less inhabited with by sharks. After four years of record lows in the extent of sea ice, researchers say the trend can no longer be blamed on short-term variability. Sea ice in the Arctic reached a record low this summer, accelerating a melting trend evident for a quarter-century. The data reveal that the rate of disappearance of ice has now risen to an average of 8% per decade. The figures reinforce previous forecasts that the Arctic is likely to be free of ice during most summers by about 2080. There remains a question mark over whether the warming is tied to some natural long-term cycle, such as the Arctic Oscillation, which brings warmer air across much of the Arctic. But while the oscillation is currently in a warm phase, this has not increased during the past four years and the suspicion is growing that climate change caused by human activities is to blame. Climate models predict that global warming will be amplified in the Arctic. This is because as white ice is replaced by dark ocean, the sea surface will absorb more of the sun's radiation and reflect less back into space. Greek MPs have passed in principle new laws to lift restrictions on SCUBA diving. They hope to help make Greece one of the most popular worldwide destinations for scuba-diving holidays. In past years, recreational diving was strictly restricted in Greece in order to deter antiquities smugglers, with diving only permitted in specific, closely-watched locations. If you purchase a travel insurance policy before December 31st you could win a travel pack valued at over AUD$4,000. This insurance has no limit on the depth you can dive! Underwritten by Allianz, World Nomads offers low cost travel insurance in over 44 countries. With genuine 24/7 assistance anywhere on the planet provided by Mondial Assistance, the world's largest travel insurance and assistance company, and online claims and extensions from anywhere in the world while you are still away, World Nomads offers some of the best travel insurance in the world today. Policies include diving to any depth provided you hold an open water diving licence or you were diving under licensed instruction. Worldwide cover is available to travellers from over 44 countries. You can buy, extend and claim online, from anywhere in the world, even while away from home. As well as diving, World Nomads covers most adventure sports from bungee jumping in New Zealand to white-water rafting in Colorado. The World Nomads travel pack prize contains a Canon 8 mega pixel digital camera tucked in a Crumpler camera bag and a 60 gig iPod photo with a world travel adapter kit to store your pics while you are on the road, while listening to your favourite travelling tunes and reading one of your two Lonely Planet guide books, which you dug out of your Macpac backpack knowing that you still have a few months left of worry-free travel because of the $2,000 AUD worth of travellers cheques in your hip pocket. Increases in carbon dioxide are bad for corals – no matter how you look at it. That’s the conclusion of two researchers in the September issue of the Journal of Geophysical Research-Oceans, who investigated the effects of doubling carbon dioxide on two coral species that are important reef builders in Kaneohe Bay, Hawaii. Langdon and his colleague and co-author, Marlin Atkinson from the Hawaii Institute of Marine Biology, found that this manipulation of seawater chemistry, carefully designed to mimic conditions that might happen in the next 50 to 100 years, significantly damaged the coral. Langdon and Atkinson observed a 50 percent decrease in skeletal growth at the same time that the photosynthesis of the guest algae within the coral increased. The results indicate a breakdown in the normally mutually beneficial relationship between this guest algae and host coral. A similar breakdown has been widely reported when corals are exposed to elevated nutrient concentrations. Competition for carbon between the algae and the coral may be the explanation, Langdon said. THE NSW government is considering establishing an annual licence for scuba divers similar to that required by fishermen. The Primary Industries Minister Ian Macdonald said the scheme would involve the creation of an independent scuba diving trust, made up of industry members, who would allocate licence costs to programs to improve amenities for divers. The trust also could invest funds towards programs to protect the habitat areas of the critically endangered grey nurse shark. "The state government was previously considering introducing a fee to dive in these areas but the licence system will be simpler and fairer – instead of paying a fee for each dive in the habitat sites, divers will now have an annual fee," Mr Macdonald said. He said he had recently met senior diving industry representatives, who expressed support for the proposal.